Barcodes are used in every aspect of the healthcare industry. From the moment a patient walks into the door to the moment they pick up their medication at the pharmacy, barcodes are helping healthcare professionals track inventory, medicine, and even the patients themselves! Although barcodes have a variety of uses in this field, they all have one common goal: to keep patients safe. Here are five examples of how barcodes are being used in a patient’s journey. Many hospitals already have a policy that mandates patients to wear an identification bracelet throughout the duration of their stay. More and more hospitals are giving these wristbands a face lift by adding barcode technology to them. When a healthcare professional scans the bracelet, he can make sure that he is treating the correct patient with the correct procedure. A mobile point-of-care solution not only lowers costs, it also increases efficiency and patient safety. Nurses and staff can collect information from a patient’s identification bracelet, include the ability to electronically access his or her medical charts. Healthcare professionals can also update a patient’s medical records, which will transfer to the hospital’s database system. The Food and Drug Administration requires certain medications to have barcodes on them. Part of the information stored on the barcode includes the National Drug Code, which is a 10-digit identification number for that drug. The National Drug Code includes the name of the medication, dosage, drug manufacturer, and expiration date. This helps nurses practice the 5 rights of medication administration, “right patient, right medication, right dose, right time, and right route of administration.” According to a 2010 study published in The New England Journal of Medicine, the use of barcodes prevents more than 90,000 critical medical errors each year. It’s every pathologist’s worst nightmare that specimens will be mixed up and the wrong diagnosis will be given to the wrong patient. And this nightmare is a reality too often. Approximately 160,000 medical errors are caused each year due to a misidentification of a laboratory sample or patient. What does this mean exactly? Hundreds of thousands of patients receive false test results, leading to inappropriate medical treatments. 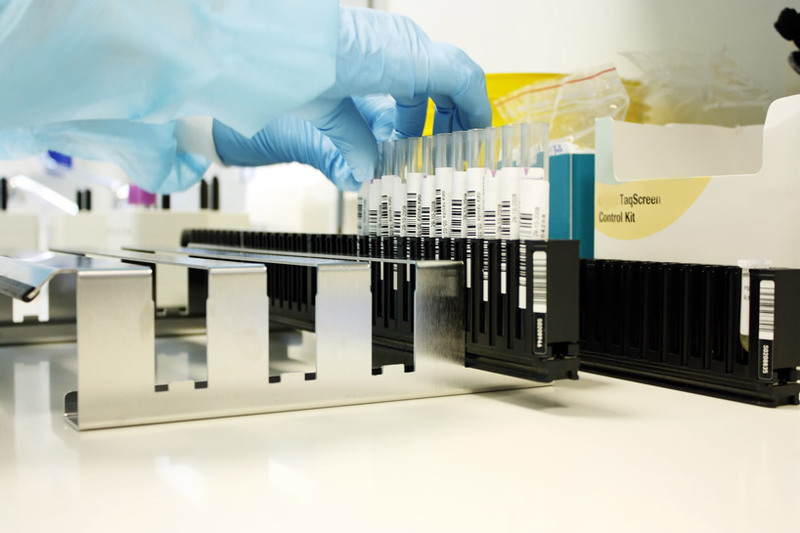 Implementing a barcode system increases labeling accuracy and efficiency in a hospital’s lab. Barcode labels come in all shapes and sizes, as well as materials that can withstand getting wet, certain chemicals, and extreme temperatures. One of the largest uses for barcodes in the healthcare industry is in blood banks. The FDA requires that all blood and blood components (plasma, red blood cells, etc.) collected after April 26, 2006 have a barcode in order to eliminate errors in blood transfusions. Each barcode must include the following: the source of the blood, the blood donor’s identification number, the product code, and the blood type. Blood transfusion safety overlaps with patient identification technology because nurses are able to ensure the right patient is receiving the right type of blood. It’s no secret that hospitals manage millions of dollars of assets on a daily basis, which makes inventory management a time-consuming and tedious process. Implementing a barcode system can help keep track of materials and expedite the ordering process. Staff in the hospital’s pharmacy can scan a drug’s barcode, which can be set to automatically reorder once a certain inventory level has been reached. Barcodes can trace a piece of equipment back to the manufacturer in the event that it is damaged and request refunds from distributors. Barcodes can also track the last person who used the equipment and with which patient. Healthcare professionals need barcodes in order to effectively track inventory and to ensure that each patient receives the proper medical treatment. Aside from preventing waste with ineffective inventory management, barcodes can help medical professionals avoid costly lawsuits by giving another defense against improper medical treatment. If you’re looking for a custom barcoding system for your healthcare business, call us today to schedule a consultation.